Windows Live Mail is the free email client for Windows, available as part of Windows Live Essentials 2011. Offering email, calendar, contacts, RSS feed management and access to Usenet, Windows Live Mail is a very functional alternative to the expensive Microsoft Outlook. However from time to time you might find that Windows Live Mail encounters one or two problems. One of these might be that the software is frozen, preventing you from accessing any of the different views and accounts that you might have setup. If you find that Windows Live Mail is not responding, take a look at the following fixes which should resolve the problem for you. Windows Live Mail relies on your internet connection to send and retrieve email. In addition to this you will have set up one or more email accounts and these might be either POP, IMAP or in the case of a Windows Live account, MAPI. As you can see, there are various reasons why the software might fail and end up freezing or hanging. To troubleshoot this, open your browser and check whether you can browse the web. If you can, then the problem is not with your internet connection, so you can proceed to the next step (problems with your internet connection can usually be resolved by restarting your PC and modem/router). Problems with Windows Live Mail hanging can be caused by problems that the app experiences collecting email. Particularly, the app is not suited to large IMAP inboxes so if you're using an email account of this type and have lots of email or lots of folders then you might be advised to consider a different email client. You should contact the administrator of your email server to check for any problems, however. To check connectivity with Windows Live, visit status.live.com. None of the Windows Live Essentials applications can be considered 100% stable, which is a shame as they're all very useful. Windows Live Mail freezes and hangs are usually pretty hard to get out of, so pressing CTRL+ALT+DEL or right-clicking the Windows taskbar and selecting Start Task Manager is the best way to exit the program. In Task Manager, find the application and select End Process, and then try restarting the application. In most cases, Windows Live Mail will take a few minutes to load up, but once it does every will run without a problem and you can carry on as if nothing happened. If you find that Windows Live Mail is not responding after performing the previous suggestion, attempt to run the application in Safe Mode (accessed by restarting your PC, tapping F8 after the BIOS splash screen and choosing Safe Mode with Networking). Hopefully you should find that the issue is resolved, and that the software doesn't hang. However as you're in Safe Mode, this isn't ideal. You can get around this by first backing up your email using the Menu > Export option, and then removing your email accounts. Next, reboot your computer into the full Windows and try out Windows Live Mail again – it should work without a problem, and you can begin to add your email accounts again. Your final option when Windows Live Mail fails to respond is to repair the software. Do this via Start > Control Panel > Programs > Uninstall a program and double-click Windows Live Essentials 2011. 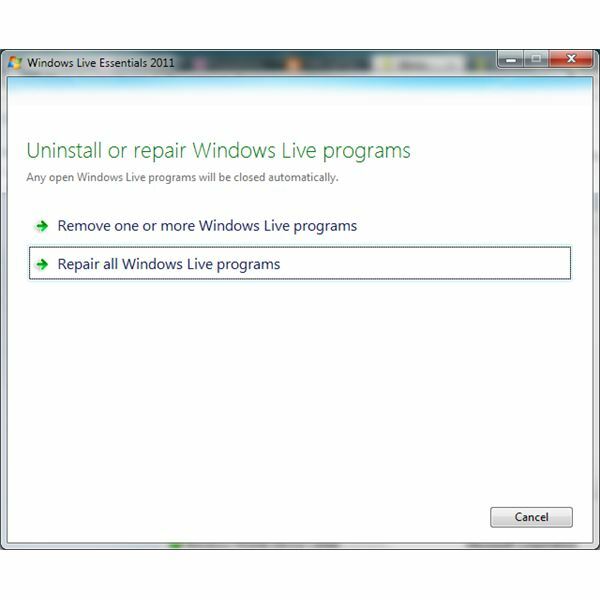 Select Repair all Windows Live programs and wait – the mail client should be reinstalled and your problem resolved!